Hello and Happy Hump Day! It been a super rainy week so far but thankfully no bad storms around here... just a lot of rain. What better thing to do on a rainy night than craft, right?? Since today is Wednesday that means it's time for another Paper Craft Crew Challenge. I love this week's sketch.. there are so many possibilities! Even though I used this same Gina K Designs My Anchor Mini Kit yesterday, I still had the desire to ink up more of the stamps in it. I decided to go with the truck stamp this time because it really looks like such an old classic! I think I'll get a lot of use out of this one! All of the Patterned Paper is from the kit as well. 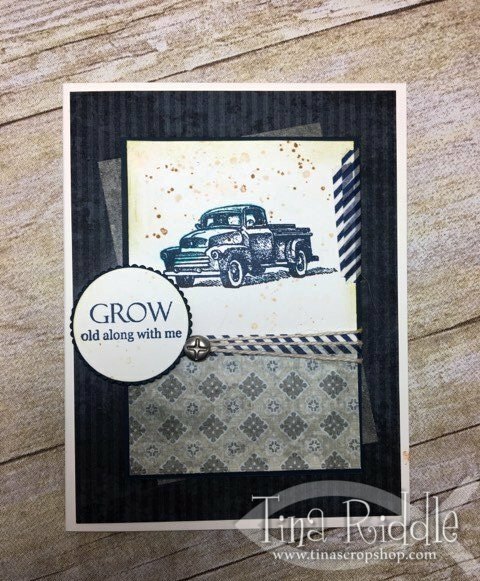 After I stamped the truck image with the Gina K Designs "In the Navy" ink cube, I added some splatters in various tans and browns and then dabbed it with a little water. The water made my truck image bleed a little but I felt like since it was supposed to look old that it added to the look. This is definietly a grungy look but I really love it and I think it goes well with the Grow old along with me sentiment. There includes a "The best is yet to be" sentiment for the inside of the card as well.